Marc Denis' personal approach and vast experience in all aspects of voice work make him a valued asset for your voice over project or production. Marc Denis does more than just deliver effortlessly in two languages. If needed, he can proofread script translations to ensure that your message is communicated accurately. Hard sell, soft sell, strong authoritative delivery or warm and friendly tone…straight read or playful approach in English, in French... or BOTH, Marc Denis is the bilingual voice over talent. These audio voice over demos demonstrate some of the range of styles and deliveries from Marc Denis. Marc Denis works seamlessly in French as well. His French-language demos here. you can click on these links below to download for free. 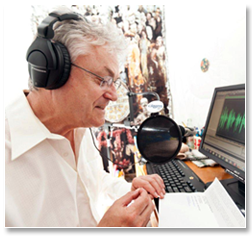 When it comes to TV and Radio voice imaging, movie trailer voice overs, infomercials, multimedia voice overs, corporate videos, Web sites or phone system voice overs... Marc Denis is the bilingual voice talent.